The removal of unpleasant smells from the human body, fabrics and living spaces has been a challenge across the years. Despite considerable investment by large companies there is not yet a complete solution. Now authors of a new R&D management white paper on the subject, Steve Bone and Ian Murphy of nu Angle and Andrew Guttentag, Research Chemist in Transformational New Product Development for Church & Dwight Co. Inc, argue that an external scouting and multidisciplinary approach to technology strategy is creating breakthrough innovation. Malodor control is one example of how good R&D management can be used to solve difficult innovation problems and create game changing products. 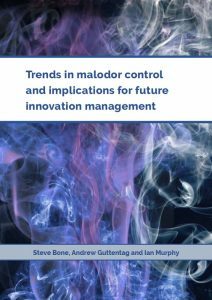 The authors of the white paper ‘Trends in malodor control and implications for future innovation management’ have completed several strategic assignments in this area and identify different parameters of the space, such as how to define and measure malodors, given that it is so subjective both individually and culturally. They conclude that an innovative solution lies in the clever combination of different technology management approaches to masking or removal. Methods of odour removal include: adsorption, where the odorous ions, atoms, or molecules ‘stick’ to the surface of another element; absorption, where the malodor infuses into the bulk of the substrate; and entrapment, where volatile molecules are removed from the air by interacting and encapsulating them (e.g. cage compounds). Other approaches to removing the source of the odor could be microbial or chemical, including vapour chemical reaction to destroy the odor, surface coatings; photocatalytic activity; or biological activity. The authors conclude that many of these approaches are looking promising but that to exploit these opportunities a radical paradigm shift is required in the approach taken to malodor control innovation. It has been found that rather than have small R&D teams working in isolation it is proposed that the technology management strategy needs to be multidisciplinary, encompassing marketing, operations and R&D, and informed by insights from external experts drawn from different fields. Finding these wide-ranging experts and changing the internal R&D management culture is difficult and one reason why more progress has not been made. The only way would be through a team facilitated structured approach using good practice tools and techniques that look outside the company’s sector. In their white paper the authors describe the creation of an internal malodor platform team, outline the six areas of innovation management that need to be tackled at the same time and define a well proven process for achieving a successful technology strategy. Click here to read the paper on R&D Today: Trends in malodor control and implications for future innovation management: by Dr Steve Bone, Co-founder and Director of nu Angle, strategic technology management consultancy; Dr Andrew Guttentag, Research Chemist in Transformational New Product Development for Church & Dwight Co. Inc; and Ian Murphy, senior adviser to nu Angle. This entry was posted in Blog and tagged Church & Dwight, malodor control, malodour control, Technology Platforms, technology strategy, white paper by rachel. Bookmark the permalink.